This morning when the Avast engine & virus definitions automatically updated with the little green box rising up in the task tray, right beside it another update box appeared there also. I clicked on it, thinking it was about Avast also. But, it was not from Avast it said it was an Adobe Air update, so I didn't do the update before I checked with you about it. 1. Are you familiar with adobe air? I've never heard of of before, & certainly didn't even know if I had one.? 2. If you say I need to install if & when it pops up again, OK.
Adobe Air probably came with your computer and is in Programs and Features. It isn't something you need and you can uninstall it, or disable it in Services if you don't want to uninstall it. probably would be easier for me to just uninstall it, if I could find it....here's a scr. shot, is it under one of these headings? Programs and Features - where you uninstall all applications. musta had a senior moment! after i posted this question & scr shot last night, as I was shutting down the computer for the nite, it struck me like a lightning bolt: Programs and Features!!!! sorry about that.....is there any cure for senior moments????....... ;^) thanks, i've got it done now thanks!! Well, I thought I had it done....I had an Avast Software Updater, & it included Adobe Air & IE(32 Bit). Last nite as I was gonna shut the computer down I went to Programs and Features & did the Uninstall. I checked Programs and Features before posting this, & Adobe Air is back on the list.??? Here's scr. shots that should explain what I'm dealing with, & hope you can instruct me please.? 2. This came up after clicked "Fix It". 3. This resulted when clicking to see the Update, which makes no sense to me. What's Bing got to do with this? 4. This shows that Adobe Air returned to the Programs list after I uninstalled last nite.?? 5. Do I need to try the Uninstall of Adobe Air again? Can you tell me what needs to be done please? The avast updater is only in the Premier version of avast. When you allowed the update of avast to version 8, you must jhave selected the Premier option instead of the Free option during the update, and hence you have a trial version of Avast 8 Premier that will expire in 30 days after the update. Whether it reverts to the free version or you will have to uninstall it and install the free version, I don't know. One option is to uninstall it if you still have the Avast setup application for version 7 in your Downloads folder and install that. Otherwise, just wait and see what happens. Or, you can pay them $69.99 and keep the Premier version. When you clicked "Fix it", you apparently reinstalled Adobe Air after having uninstalled it from Programs and Features. Uninstall it again, and look for a way to disable the Avast Updater. Don't use that feature at all. You need to pay attention to all the options you are given during updates and installs and select only the options you want, or this kind of thing that you don't want to happen, happens. I just update to Avast 8. The software udpater is new to the free version of avast 8.0 I now have it. Don't know anything else yet - just now got it. The free version of avast 8 inlcueds an update - that you have to run - you click a scan button - it lists programs that need to be udpated - and you have to click on the fix it button by each program you want to update. The premeired v arions has an automatice version of it - don't know anything about that - except there is a button on the free version to activate automatice updates - if you click that it takes you to a window to buy the premiere version. The avast updater is only in the Premier version of avast. When you allowed the update of avast to version 8, you must jhave selected the Premier option instead of the Free option during the update, and hence you have a trial version of Avast 8 Premier that will expire in 30 days after the update. Whether it reverts to the free version or you will have to uninstall it and install the free version, I don't know. I called myself paying close attention to the install. I actually unchecked the box that wanted to install google's chrome tool bar. One option is to uninstall it if you still have the Avast setup application for version 7 in your Downloads folder and install that. I'm gonna post picture of my "downloads" & see if you can tell if any of the Apps in there is any Version of Avast? Because, I don't see anything that appears to be Avast. Otherwise, just wait and see what happens. Or, you can pay them $69.99 and keep the Premier version. Don't want that $$$ version. When you clicked "Fix it", you apparently reinstalled Adobe Air after having uninstalled it from Programs and Features. That can't be. I did not click on the Adobe Air button at all, cause I knew that I had uninstalled it the nite before. I only clicked "Fix it" for the Internet Explorer box, & the 2 Windows Update screen shots shows you where clicking the IE "Fix It" button took me. Why did that take me to windows Update section, & the only update available is the "Optional" "Bing Desktop"?? Uninstall it again, and look for a way to disable the Avast Updater. Don't use that feature at all. You need to pay attention to all the options you are given during updates and installs and select only the options you want, or this kind of thing that you don't want to happen, happens. That's what I called myself doing. Here's the downloads screen shot for you to view. Thank you! Sorry, haven't allowed the update yet, so not sure exactly what happens during the update with regard to the options given. Just know that the Premier version is the only one containing that Avast Updater feature. Thought you had clicked on the Adobe "Fix it" and that is why it came back, so don't know why it came back if it was uninstalled and you didn't do that. Try to find a way to disable that feature in avast and look for any Adobe Services and Stop the service and change their Startup type to Manual (Control Panel > Administrative Tools > Services). You can disable Adobe Active File Monitor. No, the avast setup application is "avast_free_antivirus_setup.exe". Did you create a "My Downloads" folder and maybe put it there? If you can't find the avast 7 verson setup application and things are working ok the way they are, wait until your trial period runs out and see if it reverts to the free version. At worst, you'll have to uninstall it and download the free version. Bing is an optional Windows update. You can install it or not. Bing is a search engine like google and interfaces with your browser. 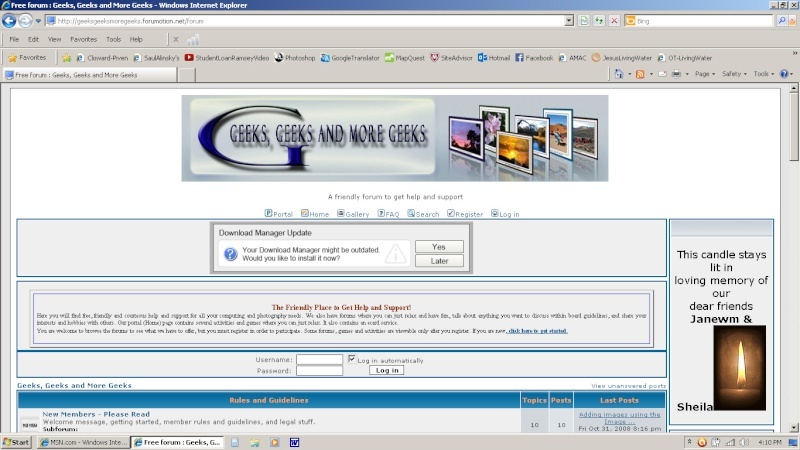 You will find the application in Programs and Features if it is already installed. Did you see my post. The avast 8 free - contains an updater - but not auto update. The auto udpateter is only premiere, but the new free avast 8 contains a version of the updater - you clcik a button to scan - and then have to click beside each one you want to update. There was no option given wheter or not you want it, but you you do not have to use it if you do not want to. You have to go into avast and click on update - click scan and then click for each thing you wnt to udpate. It will not run automatically like it can on the premiere version. 1. Repa Said: Bing is an optional Windows update. You can install it or not. Bing is a search engine like google and interfaces with your browser. You will find the application in Programs and Features if it is already installed. I think you're missing my point. When clicked "Fix it" for the Internet Explorer box, & the 2 Windows Update screen shots shows you where clicking the IE "Fix It" button took me. Why did that take me to windows Update section, & the only update available is the "Optional" "Bing Desktop"?? When I clicked Fix it on the IE button I was taken to the Windows section?? That's all I know.?? Here's another scr shot showing that I stopped the Avast Software Updater. This last screen shot of the Avast updater is an edit about 10 minutes later .What else do I need to do now. ?? Edit: I just noticed at the top of the updater screen shot it says "Avast Free Antivirus". Do you see that. Don't that mean that my version is the "Free" version?? Thanks for the info Fay, I didn't see your post before until just now. I haven't had time to look into this and download the update before reading about it other than to observe the feature by feature comparison on Avast's site between the free and premier version, and the free version there doesn't show the updater, nor does the Internet Security version, only the Premier version. Looks like Avast is going the way of all the others and creating a resource hog with unnecessary features instead of keeping it simple and focusing on detecting and stopping malware. Have you noticed any difference in performance since you updated to version 8? I just may not update to this version until I have no other choice. WC, I don't know why Avast Updater sent you to Windows Update other than to do the update manually yourself. Bing is an optional update. "Fix it" is misleading - it apparently sends you to whatever location you need to do the available update. I don't know what is going on with Adobe Air, but you can leave it on your system or uninstall it, your choice. It isn't needed, but it doesn't hurt anything being there. If you don't uninstall it again, just make sure it doesn't run at startup by disabling it in Services if it's there, or uncheck it in msconfig if it's there. The Avast version 7 setup program for installation is not in the Program Files folder. Your screenshot is the installed Avast 8. Just go with things as they are and do your updates as you always have before installing Avast 8. Looks like from what Fay said that it is included in Avast Free even though the documentation I read indicates otherwise. You should be fine. 1. Have you noticed any difference in performance since you updated to version 8? No, I haven't. 2. you can leave it on your system or uninstall it, your choice. I assume Repa that you don't have Adobe Air? 3. It isn't needed, but it doesn't hurt anything being there. If you don't uninstall it again, just make sure it doesn't run at startup by disabling it in Services if it's there, or uncheck it in msconfig if it's there. If I don't need it I'll just redo the Uninstall. 4. The Avast version 7 setup program for installation is not in the Program Files folder. Your screenshot is the installed Avast 8. That's the way I saw it also. 5. Just go with things as they are and do your updates as you always have before installing Avast 8. Well, I've been trying to pay close attention to any install I do anymore, reading all the text carefully to be sure I don't accidently accept some extra packaged download crap that they might have piggybacked onto the download. 6. I hope you will notify me if you find out anything more about Avast 8? and if you get it or not? 7. After an old version of Avast(ie Avast7) or any other Apps for that matter, get deleted when doing a newer version update, such as I just did with Avast 8, I assume there's no way to retrieve the previous older version, is there? Many thanks! I have not noticed any difference since installling avast 8 but just installed it yesterday. I am not 100 percent sure, but I don't think the updater does anything unless you go tell it to scan. Not sure why they added it and doubt if I will use it, but I don't know that it hurts anything if you don't run it. Repa, if you find out differently, let me know. 6. [color=green]I hope you will notify me if you find out anything more about Avast 8? and if you get it or not? It will be a while if I do get it. Things are in a mess at my house right now, and I don't see any change tfor a week or more. 7. After an old version of Avast(ie Avast7) or any other Apps for that matter, get deleted when doing a newer version update, such as I just did with Avast 8, I assume there's no way to retrieve the previous older version, is there? No, just forget about it. I'll check Avast 8 out when I have time to mess around with it. Fay, let me know if you see any difference in performance or any problems with Avast 8 in the next week or so. I read about some virus definition update problems with it yesterday. Thanks. I have just read sevaral posts of peopel being unhappy with avast 8 becuase it does not work witn Zone Alarm. But I use windows firewall so that is not a problem for me. Try the link above now. It was in error.